The Bitcoin price is rising again. In October, Bitcoin was up 14.63%, and it's already up 5.74% in the first few days of November. For the year, the price of Bitcoin is up about 70%, having risen from about $434 to $737. The question of why Bitcoin has been rising so quickly in recent weeks actually has multiple answers. While several of the reasons floated by other media outlets are on the right track, they haven't got it quite right. And other, less apparent reasons for Bitcoin's rise have been missed altogether. 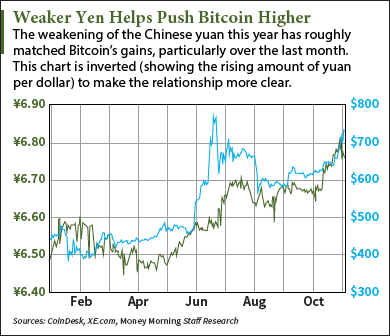 The top theory for the sudden increase in the Bitcoin price in October has to do with the Chinese yuan. As the Bitcoin price has soared this year, the yuan has dropped about 4% against the U.S. dollar, a significant move for a foreign currency. In October alone, the yuan fell about 1.5% against the dollar. This spawned the theory that Chinese investors trying to move yuan out of the country into offshore investments have been using Bitcoin to skirt China's strict capital controls. To be sure, capital has been fleeing China at record rates. In August, $27.7 billion in yuan left China, and in September, the figure ballooned to $44.7 billion. For perspective, that's 10 times the $4.4 billion monthly average yuan outflow for the 2009-2014 period. But contrary to what some pundits have said, the wave of yuan outflow is not the primary driver behind the rise in the Bitcoin price. It's not that hard for Chinese investors to buy Bitcoin, but converting to another currency is a different story. "A bitcoin trader cannot transfer his Chinese yuan into foreign currency through buying and selling bitcoins," Xiao Yue, a customer service representative from Chinese Bitcoin exchange Huobi, told the South China Morning Post. But the yuan decline is playing a role in the rising price of Bitcoin. "As the yuan enters a path of depreciation, investors will consider investing in assets that can preserve value and hedge risks," Zhu Jiawei, Huobi's chief operating officer, told Bloomberg. And though Bitcoin isn't much help in getting around China's capital controls, the limits those controls impose make the digital currency one of the few practical ways the Chinese have to protect themselves against the sinking yuan. Despite the strong performance of Bitcoin over the past year, one dark cloud has hung over it. Starting in the summer of 2015, a split developed in the Bitcoin community about how best to deal with the built-in limit to how many transactions could be processed by the network. The root of the problem is the one-megabyte size of the blocks on Bitcoin's blockchain, the network that enables, verifies, and stores all transactions. The debate was over whether the size of the blocks should be increased to enable more transactions. The fight caused the price of Bitcoin to fall 21% in three weeks last summer. But a possible solution called "segregated witness" (also known by the abbreviation SegWit) debuted last Thursday after much anticipation. Basically, SegWit squeezes the data in each block to make room for about twice as many transactions – without increasing the size of the block. It's unclear if enough users of the Bitcoin network will adopt SegWit to make it official – the threshold is a lofty 95% — but the release of it into the wild has raised optimism the impasse will be resolved. And just as the "Bitcoin civil war" last year dragged the Bitcoin price down, the possibility of a resolution is helping to push it up. They may not be able to sell bitcoins on Huobi for foreign currencies but what is stopping them from transferring their coins to an exchange outside China and doing so there? I suspect nothing and this is exactly what they are doing. Bitcoin? Is there some help for me there? We did this a while back: http://moneymorning.com/active-premiums/how-to-buy-bitcoins/.